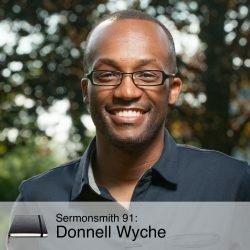 The Reverend Donnell Wyche currently serves as Senior Pastor and Head of Staff at the Vineyard Church of Ann Arbor where he has served for 18 years. The Vineyard Church of Ann Arbor is a growing multi-ethnic, multi-generational church in the progressive left-leaning city of Ann Arbor, MI. Passionate about the intersections of race, faith, politics, and technology, Pastor Donnell has served as a national task force leader for youth ministry and multi-ethnicity within VineyardUSA. He has led seminars and trainings on becoming culturally competent, transitioning your church to a multi-ethnic church, and has served as a part-time instructor in web technologies at Washtenaw Community College. Pastor Donnell is the president of the board of the InterFaith Council for Peace and Justice and has pursued issues of affordable, fair, and accessible housing as a board member of the Religious Action of Affordable Housing (RAAH). As a trained computer engineer, Pastor Donnell created, in partnership with the late Phyllis Tickle, the online home of The Divine Hours available at annarborvineyard.org. His latest technology project is Community Center for Churches, a software tool to help pastors better care for and shepherd their congregants, available at getcommunitycenter.com. Pastor Donnell is married to Maria, an early childhood advocate and speech-language pathologist, and together, they are raising three multi-ethnic, spiritually engaged, peace loving, politically aware, woke activists!